Raised Bed Gardening tips and how-tos. Raised gardens are popping up everywhere; rural, urban and suburban areas lend themselves to raised garden beds. Here's how to get started. 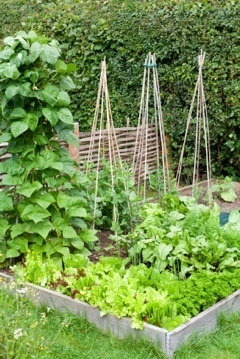 Raised Gardens can Increase Your Growing Season. Raised garden beds contain the soil in an enclosed area above ground level. Typically framed with lumber or composites to span 4 feet wide by 4-6 feet long, raised beds can also be large containers such as bathtubs, horse troughs, cattle feeders, wheelbarrows or any other container that holds soil. Raised gardening has many advantages over traditional gardens. They warm up faster in spring, retain water better, and have a superior overall soil quality than their traditional garden counterparts. Additionally, they fit neatly into a small space and since you don't need to walk in them, the soil stays fluffy and workable. A raised bed vegetable garden is a great place to try your hand at organic gardening. A raised bed can be a mound of soil used as a garden. Plants are placed into the top of the mound. A pathway goes around the base of the soil mound so there is no foot traffic where the plants grow. The garden soil does not get compacted and stays friable. Another type of raised bed garden incorporates container gardening techniques. The garden bed is not only raised but it is contained with a border made of wood or synthetic material. The frame on this type of raised garden helps keep the soil from eroding away. Bags of soil are another type of raised bed garden. Just lay the soil bags down on the ground, cut a large slit in down the middle and put in the plants. The bag holds in moisture, keeps out weeds, and the whole garden can be moved to the compost pile at the end of the season. Hay bales make good raised bed gardens. These beds are ideal for those with back problems or handicapped individuals. Holes are dug in the bales and filled with soil. Water well and leave it cook for a couple of months. Put the plants with additional soil into the holes. Strawberry container gardening is a type of raised bed garden. Commercially available tiered gardens for strawberries save space, keep strawberries contained, and many have their own watering system. The tiers allow gardeners to double or triple their growing space. The advantages of raised gardens over traditional gardening are many. The raised bed does not get foot traffic. This prevents the soil from becoming compacted. The raised bed garden has more surface area than a traditional garden. The soil warms up faster in the spring and stays warmer in late fall and into winter. Raised garden beds have the ability to be easily covered. Cloth row covers can be draped over crops to keep out unwanted pests, protect your planting from frost or to provide temporary shade. Plastic sheets can be placed over a raised bed to protect plants from early or late frosts. Ideal for a 3 foot (1 metre) wide bed this Set of 12 - 59" Fiberglass Hoops, provide an arc over the bed that's perfect for draping netting, fabric or plastic over. The loose soil in a raised garden keeps moisture and nutrients available for the plants. Raised beds are well drained. The loose soil allows for optimal root growth. Raised garden beds produce healthier, more productive plants than traditional gardens do. Start with a raised bed of your choice. Fill with rich, nutritious soil. Add plants to the top of bed. Water well. Provide sun. Add mulch periodically to help keep the soil moist and to add continual food for the plants. Mulch can be compost, peat, steer manure or any other organic material. Create a pathway around the base of the raised bed. The raised bed should be small enough to be able to reach it from all sides. Length is not important if the bed is no deeper than three feet and you can reach the bed from all sides. This size will prevent you from stepping into the bed and compacting the soil. Water the raised bed with a garden hose, sprinkler, or drip irrigation system. Drip hoses are easily concealed under mulch. Maximize your garden yields by using square foot gardening techniques. Mark off one square foot measurements prior to planting. Add plants at an average of one plant per square foot. Raised gardening is one of the easier ways to quickly improve your garden's productivity. This easy gardening method provides for better plant growth, fewer pests, and increased yields.